Today’s game is part of the revamped C&G tournament; the format of the competition now changed to two conferences of 10 playing each other once, the winners of each group advancing to the final. With the minor counties removed and a whole host of dead games guaranteed as teams become unable to finish top, it has once again been another classic piece of committee thinking by the ECB. It may have broken in their eyes, but this wasn’t the way to fix it. Cricket, to my mind, needs a straight knockout cup competition, and aside from the latter stages of the Twenty20, it no longer has one. Hampshire, after their indifferent start, are now challenging at the top of the C&G Southern Conference for that single final place. It would be hard to deny the influence of cricket’s most famous name of the modern era on a club that spends big but has flattered to deceive up to Warne’s more permanent arrival in 2004. He has engineered a winning spirit among a Hampshire squad that otherwise would rarely be as great as the sum of their parts. With both sides arriving at this game with a County Championship win achieved the previous day, the contest looked to be an intriguing one. 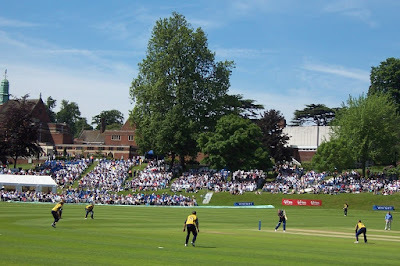 However, while Surrey’s victory was achieved here at their charming south Croydon out-ground, Hampshire had chased down an astonishing 404 in the fourth innings all the way up at Headingley. As a result of the geographical stretch, the Hampshire side only made it to London at 3am in the morning. However, despite the sleep deprivation, it is Hants that start the game the more lively, Billy Taylor having Scott Newman caught by Greg Lamb at slip with the second ball of the day. Trundler Bill is an unpretentious solid professional, who occupies a stopgap role that has been fleshed out by Chris Tremlett’s continuing injury problems. I would say he doesn’t exactly pull up trees, but as he winters as a tree surgeon, that might be considered a little too pun-friendly and it doesn’t really apply anyway. With a hat trick already this summer, Billy also prematurely ended Michael Vaughan’s comeback first-class innings, scalping the England skipper after a mere single last week. His place in the side is now well merited, I’d suggest. Newman’s fellow opener James Benning doesn’t last much longer, falling to a splendid full-length diving catch by wicketkeeper Nic Pothas. After a second strike for Trundler Bill, however, skipper Mark Butcher steadies the rickety Brown Caps trolleybus, scoring steadily and quickly with Jonathan Batty following suit. For the next hour they command the Hawks attack, Butch scoring a particular sublime four with a gently guided tickle down to the finest of fine leg boundaries. He then goes about dominating Warne after warm applause greets the announcement of the leg-spinners arrival at the North End, bludgeoning two crisp fours from Warne’s second and third deliveries. At the other end, Shaun Udal’s tidy and efficient off-spin is being similarly easily dealt with, highlighting why his late-arriving Test career was possibly a step too far for him. Still, getting Tendulkar out with a pearler in India is something he’ll be able to tell his grandkids; the best part of that being he shouldn’t have to wait too long for the opportunity. With his score now racked up efficiently to 77, Butcher then scuffs a delivery back to the Udal, although Batty is already committed to the run. The confusion is such that ol' Shaggy has the time to perform a lengthy and ungainly shuffle on his knees, as though he’s having a mid-weeding attack of angina, to reach, and break, the stumps. With the momentum shifted, Warne begins his 7th over, having conceded 28 runs from his previous 6 with no reward, and induces another woefully slack piece of cricket from the otherwise well set Batty, Nic the Greek having all the time in the world to take two swipes at a stumping chance while the batsman appears unconcerned as to the possibility of having both feet outside the crease. Those opening half-dozen Warne overs may have left the crowd feeling a little disappointed, even despite Surrey’s seeming ascendancy. However, following Batty’s removal, and with his tail up, Warne proceeds to remove the remaining 5 Surrey wickets within his next 3.1 overs. 6-13 off 20 balls. Genius, to cut a long story short, just astonishing stuff. Hampshire then have a fairly simple task, to knock off 167 in 50 overs and, such is the buoyancy in the side, they manage it in virtually half that time, at points seemingly taking the piss, welting a number of balls out of the ground. Michael Carberry is the most brutal swiper, dominating the Surrey attack, spinner Nayan Doshi particularly, from the get-go. He contributes 5 sixes and 10 fours in his 88 before being caught athletically at deep mid-off. Having been brought in this summer as, theoretically, a Kent reject, Carberry has made a pretty decent start to his Hawks career. Mind you, the last Hobo cricket action last summer saw him bash a 50 for the Spitfires, so maybe it’s just my talismanic qualities. John Crawley, Carberry’s relatively silent partner, despite his 8 fours and a six, gets out a little while before his opening partner for 49 but despite their double departure with the game virtually over as a contest, Sean Ervine makes short work of the remaining runs, adding a couple of maximums of his own in a 22 so quick fire that Dominic Thornley isn’t required to get off the mark. A showboating performance by Hampshire then, so much so that they were free to ignore the exotic pitch invader, wandering idly behind the bowlers arm at long on/off for the best part of half an hour. Now, regular Hobo Tread readers will know I had quite a football season just past for animalistic on-field appearances, with a couple of dogs, a cat and a duck all taking part in the action. I really thought I’d seen it all. That is until today’s peacock on the outfield. I’m starting to think some practical joking zookeeper is following me around with the expressed purpose of weirding me out. Later this summer I will be at Headingley for the Pakistan Test match. If you see on the TV coverage of that game a rhino barrelling in from the Kirkstall Lane End, you can be assured there will be at least one member of the crowd who will not be batting an eyelid. As I make my way, significantly early, back to the train station, uproar emanates from the Hampshire dressing room. The sound of a group of men chanting “chug, chug” as one of their number belts down some victory booze is followed by a lengthy and lyrically complex composite-chant that begins “Hampshire boys are happy…” It is this team spirit that can probably be put down to the presence of a certain Australian. As the noise drifts across London, one imagines that somewhere in Australia, a wicketkeeper is cupping his considerable ears within his keeping glove and saying wistfully “Nice harmonies, Warney”.